Hello! It's my turn to feature a project over at Creative Inspirations Paints challenge blog. I made myself a set of note cards that happen to be the same size as a standard A2 greeting card, but this is one layer only. It's something simple to slip into a package when you want to jot a quick note and be mail-friendly. I used the Swirly Parchment Frame stamp from Sweet Stamps (link in section below) in cocoa to create the border. 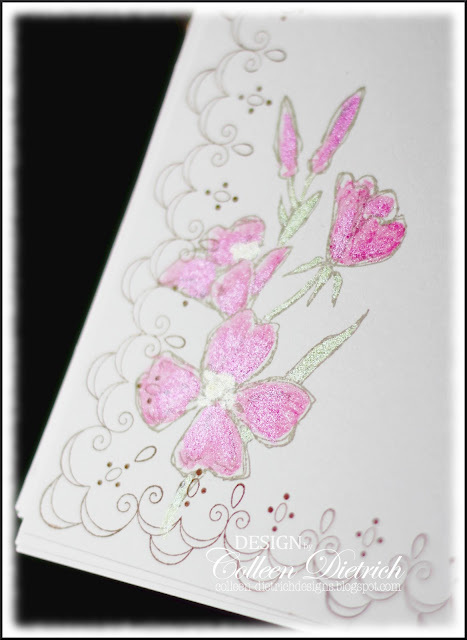 In kraft ink, I stamped a flower from Natural Beauty (SU) and then painted the images with the pretty CIP paints. In person, these paints are just full of gorgeousness. It's hard to experience it with a flat photo. Beautiful set...love that frame and how the flowers are just ever so slightly painted in. Bet they look gorgeous in person! Oh, this is so pretty, and the frame is so elegant. 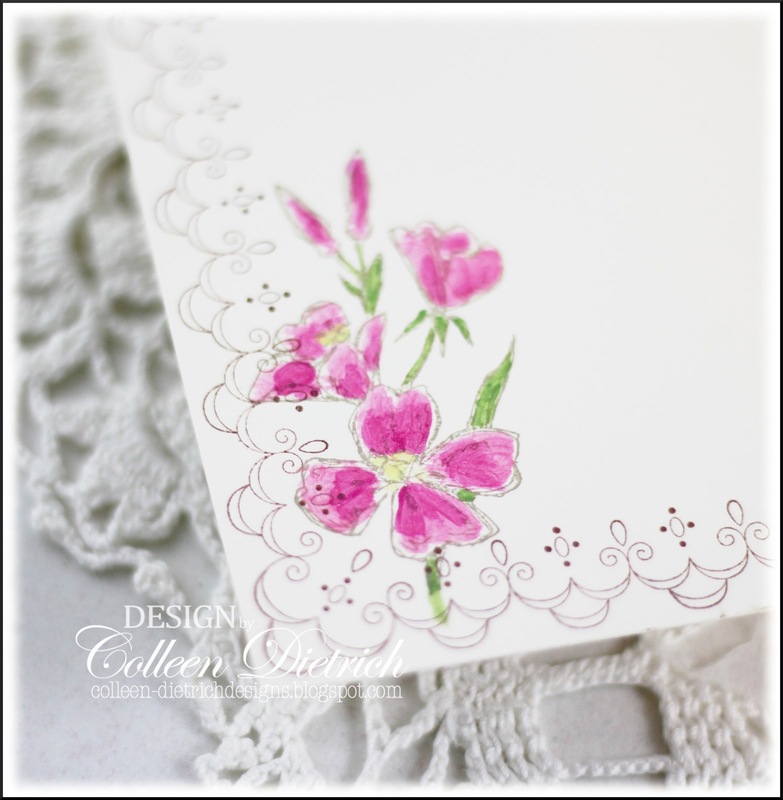 Beautiful set of notecards, love the great design and the color of the paint you used. Fabulous. Such a beautiful set of notecards and the paints are yummy. This is just perfect; touches of class andelegance. 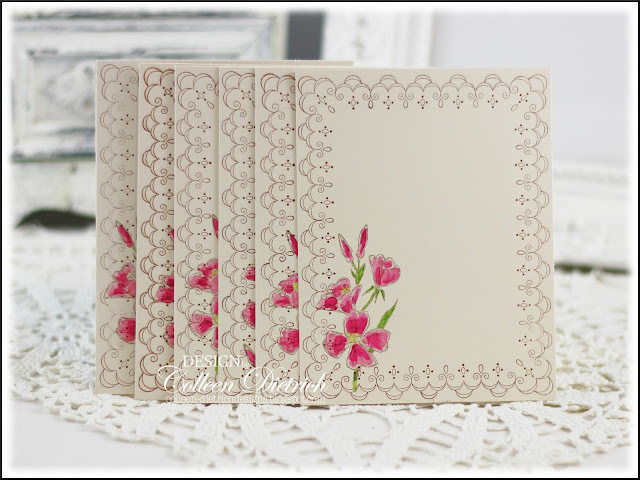 The perfect note cards.A lovely set; handmade with care and a perfect eye for gorgeous details! 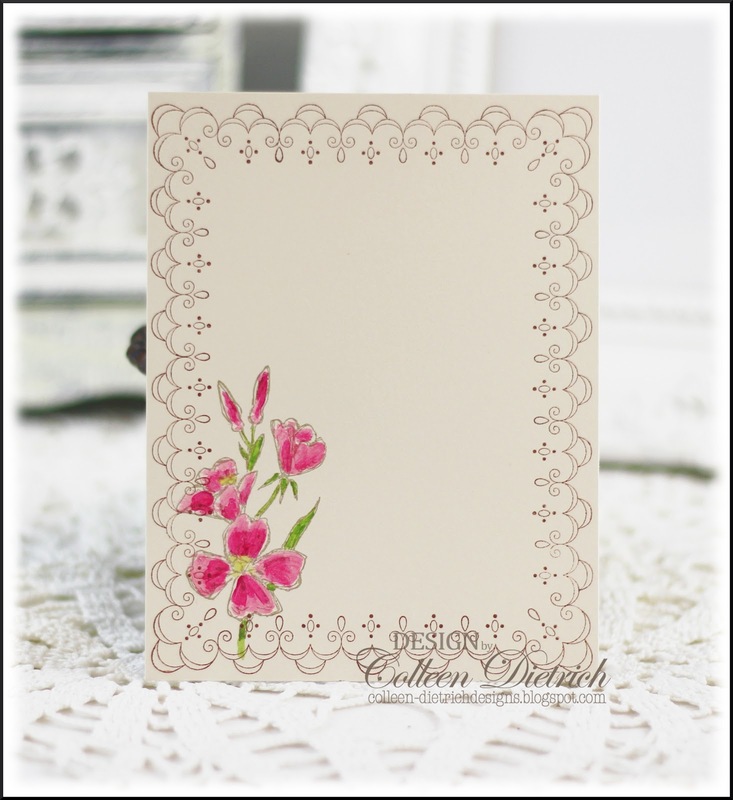 Love this swrily lacy frame Colleen and those sweet sparkly flowers! I just noticed your new blog header too! I hope it's REALLY new and I didn't miss complimenting you on it a long time ago ~ it's pretty!!! Very, very pretty. The splash of colour lifts the whole project. Oh, my word, soooooo pretty! Who needs a whole card when you can send something as sweet as this? LOVE it! Totally beautiful, Colleen! I love that you made yourself such a lovely set of flat cards--those will serve you well! These are ever so elegant and absolutely perfect! I really "need" that frame stamp ;)! It's fabulous! I love this swirly frame and your pink flowers are so pretty! Perfectly CAS!